In 1910, Mary Acworth Evershed (1867-1949) sat on a hill in southern India staring at the moon as she grappled with apparent mistakes in Dante's Divine Comedy. Was Dante's astronomy unintelligible? Or was he, for a man of his time and place, as insightful as one could be about the sky? 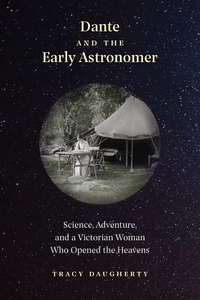 As the twentieth century began, women who wished to become professional astronomers faced difficult cultural barriers, but Evershed joined the British Astronomical Association and, from an Indian observatory, became an experienced observer of sunspots, solar eclipses, and variable stars. From the perspective of one remarkable amateur astronomer, readers will see how ideas developed during Galileo's time evolved or were discarded in Newtonian conceptions of the cosmos and then recast in Einstein's theories. The result is a book about the history of science but also a poetic meditation on literature, science, and the evolution of ideas.